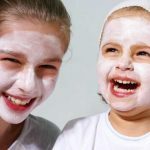 After many requests from our clients we are now offering beauty treatments for Children! Does your child/children like to have their nails painted, a facial or wear makeup? We have carefully selected mini beauty treatments for your little ones to enjoy. Your child will receive a full salon experience and will have their treatments performed by a fully qualified therapist. During their treatment we will explain each step of the treatment and how best to maintain their treatment. While still making it fun of course. One of our youngest customers is Charlotte who is 3 years old. She loves having pink polish on her little fingers and toes and can’t wait to go home to show them to her friends. Bubbly hand or foot soak, nail shaping, naturally scented hand or foot cream and princess polish. We can also add glitter sparkles, swarovski crystals and nail art if you wish. Each nail will be filed and painted with the chosen colour of the child or parent! Our Dermalogica Clear Start range is suitable for both preteens and teens suffering with the first signs of acne or for those who are simply interested in looking after and maintaining their delicate princess skin. This can be an educational experience if you choose It to be. A princess wouldn’t feel pampered without a glittery makeover. Our professional Make-up application can be applied by request of the child or parent. We use a natural, pure mineral make up to care for and protect the delicate skin of a pampered princess.